It wasn’t many years ago when domestic dogs lived long and trouble-free lives. Now, despite all the modern veterinary care and special diets, domestic dogs lead shorter lives and suffer with more health problems. You are probably reading this because you have concerns about your dog’s health. Maybe you have taken them to a veterinarian and they have given you a worrying diagnosis. Maybe they have told you their treatment is expensive, perhaps beyond your means. Whichever way you look at it, veterinary care is not cheap. What can you do? You love your dog. You would do anything for them. But there simply aren’t the means for their treatment. Do you just leave things alone, hoping for the best? Do you surrender them to a rescue centre? Do you consider the inconsiderable, the ultimate? Perhaps you do have the means to pay for your dog’s veterinary treatment, but you don’t feel comfortable with all the medication. After all, you made a switch to alternative health yourself, to your enormous benefit. Surely there is something alternative ‘out there’ for dogs too? And you’re right. There are plenty of alternatives. That are highly effective AND economical. There are many more ways to help your dog than the veterinary way. My name is Madeleine Innocent. 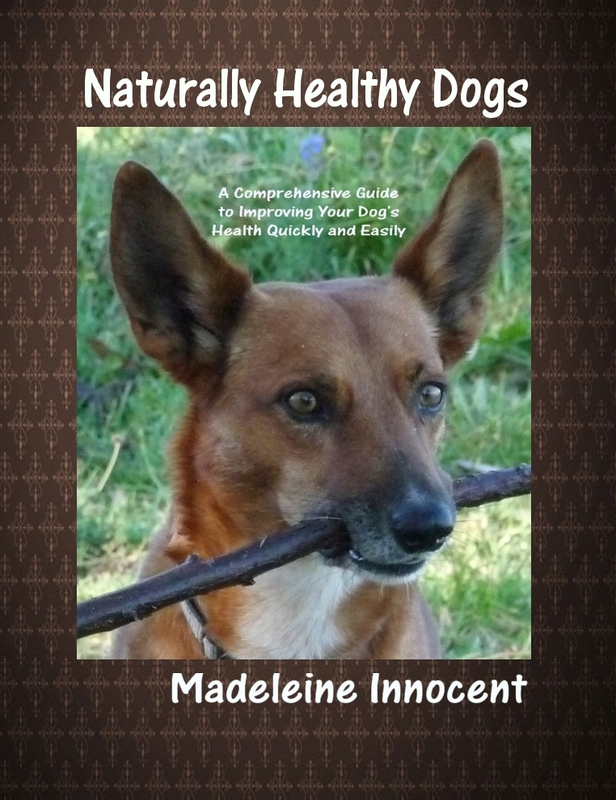 I am the founder of NaturallyHealthyDogs.com. Many moons ago, in another life it often seems, I consulted a vet with a sick cat. He asked me what I was feeding my cats. Although he tut-tutted when I told him (typical commercial cat food), he made no attempt to tell me why what I was doing was wrong, or how I could easily make some changes. Maybe he had said it too many times before and it kept falling on deaf ears. In the mid 1990’s I had a sea change in my life. I began studying homeopathy. I also started to research animal health and diet. What I discovered astonished me, upset me and made me quite angry. I bought books written by homeopathic and other holistic vets, detailing exactly what commercial pet food contained and what this was doing to your dog’s health. They showed how a simple change of diet could cure, yes cure, chronic degenerative diseases which many vets were recommending death as the only option. Things like leukemia. Things like cancer. And of course, all the other, less serious, but none the less troublesome health problems. So I set about converting my dog to a healthy diet. I made a lot of mistakes. But we came through the experience. She was only a young puppy at the time, but had categorically refused the tinned food I had presented her with, when she saw the food I was feeding my cats. So I had to rapidly learn the best diet for dogs, too. There are similarities between the two, but there are also big differences. At the time, I did yearn for some help in this process. But I was resolute. However I do know that many people can easily fall at the difficulties they can encounter. So, I decided to write about how you too can make these radical changes, much more easily than I did. Some dogs don’t like change, either, especially the older ones. Some dogs can experience a detoxing period, which looks alarming, but is a very healthy sign. So it can take time, persistence, knowledge and often support, to help you and them through the change. To help their body adapt. To make sure you are providing all the essential nutrients. At times, you may feel it’s not worth the effort. At times, you may feel that you are not a good dog carer. But it is worth the trouble. The benefits are enormous. I qualified as a professional homeopath in the year 2000 and have been in full time practice ever since, treating both humans and their animals. And the rewards have been exceptional. It is difficult to describe the feeling you have, when a terminally ill dog bounces back to life, much to the astonishment of their person. And all this from a simple change of diet and good homeopathic treatment. So now, I want to empower you. I want you to be able to achieve similar results. I want to show you how it is possible to make a simple change in how you feed you dog, to enjoy the benefits of their good health. You can make the necessary changes without the heartache I had. I know how much people care for their dogs. I know how much anxiety people feel when their dog falls ill. And I know how heart wrenching it is for people to see their dog’s health deteriorate, without feeling able to do anything to help. I know because I have felt it and so can feel the pain when other’s share their experiences with me. Currently, you don’t find holistic vets on every street corner. This will come, but maybe not in your life time. So what can you do to help your dog? The single most important change you can make that will drastically change your dog’s health, and so his life, is the diet. Once you know what goes into most commercial dog food, you will wonder how your dog ever managed to survive this long. Once you know the typical ingredients of commercial dog food, you will be as horrified as I was. Then probably as angry. When I start to tell people what goes into commercial dog food, they usually ask me to stop rather early on in my narrative, they are so horrified. They put their hands up, not wanting to know more, fully convinced and fully committed to making the necessary changes. Naturally Healthy Dogs™ takes you through the process of making these changes, step by step, answering all your concerns. I got the download and am enjoying it so much. I will never feed my dogs junk again. I feel bad that I have up to this point. Thank you so much for the info. I do feel better about it all, and I so appreciate the fact that I can ask questions, that just doesn't happen when you buy a regular book at the store. You have been so helpful. I love your work!!!!! I put my schnauzer with diabetes, Casper, on the diet the following morning and my healthier dog too. He is doing great! He loves the diet and so does the other schnauzer. He is off his insulin. He hated the shots and fought me every time I went to give them to him. I check his urine glucose several times a day and he has gone from 2 or more, to 1. So that is definitely an improvement. I am looking forward to write you and tell you that his urine is negative of glucose. Your work is a wealth of information. I stayed up most of the night reading it. I have referred to it many times since I got it. Casper has not had an accident on the kitchen floor in over a week and doesn't gulp up the water. He takes normal amounts of water now. He plays with my other dog like a puppy now. Their teeth are looking gorgeous as well. I can’t thank you enough for caring so much for our pets and their well being. I have told every friend I have. Your work is generous when it comes to explanations. I wish the whole world had this info. It really irks me that vets are not much help. Your work is worth its weight in gold. I’m so glad I got it. It has a wealth of things we need to know about our furry babies. Thank you for writing it. Thanks to you I've had my dogs on your suggested diet for the past year and they are doing great. Had one with pancreatitis but she doesn't have it anymore. She's 14 years old and has the energy of a puppy. I'm thankful for your knowledge. It's helped me tremendously as well as my dogs. Fear is common in people who don’t know the truth. Once people know and understand what they need to know to keep their dog happy, well fed and healthy, there is nothing to fear. And that’s not all. Because homeopathy is so effective, but yet to become mainstream, you probably don’t know a lot about it. So there is a whole chapter devoted to telling you about it and instructing you on how to use some of the common remedies at home, for very effective treatment. Imagine your dog gets into a fight with a neighbouring dog. He’s done this before and it always ends up with an expensive veterinary trip to treat the infected wounds. He may not be very co-operative in taking his medication, either. This time, you turn to the ebook and the chapter on homeopathy and give your dog a dose or three of the indicated remedy, as required. Before your eyes, you can see normality return. By the following day, there is little evidence that there was ever a problem. And all this without a murmur from your dog about taking the remedy. Imagine your dog gets a grass seed stuck in his paw. The area is swollen, red and painful. The last time this happened, he had to have an operation. This time, you look up the condition and give your dog the indicated remedy. Within a short time, you can tell your dog is feeling better, with less pain. The following day the swelling is much reduced and your dog is not constantly licking the area. Another day and everything is back to normal. Can you imagine how much better your dog feels? This is a separate work, as a bonus, devoted to interpreting the highly effective Bach Flower Essences for use on dogs. These are excellent remedies to have on hand for any emotional issues. For example, what to give your dog when you are boarding him prior to your holiday. He stresses a great deal away from home, even though you have complete faith in the kennels. Separation anxiety can be a nightmare for boarding facilities, too. The dog may pine, not eat, looks depressed. By putting the indicated essence into the drinking water, your dog can enjoy his stay at the kennels, making you feel less guilty about taking holidays. Naturally Healthy Dogs™ focuses on the root cause of ALL diseases. Disease is a man made phenomena. Wild dogs don’t have the diseases domestic dogs have. Focus on what humanity is doing wrong, and righting that, and your dog can enjoy the bountiful health of their cousins. To quote from a well known source, it’s better to learn how to fish, than to be given a fish. That way you enjoy the benefits of looking after yourself, rather than relying on handouts. Learn what is causing your dog’s poor health, fix that, and enjoy the benefits, along with your dog. Louie is a 5 year sterilised male dog. He had recently been diagnosed with osteoarthritis, a form of arthritis which tends to get progressively worse with time. Rita, Louie’s person, did not like the medications her vet prescribed. She brought Louie to see me in a not inconsiderable state of anxiety. The first thing I wanted Rita to do was to change the diet. I helped her through this process and she and Louie made it through unscathed in only a few days. I also prescribed an indicated homeopathic remedy to support the arthritis. About a month after the start of the new diet, Louie was racing around like a young 5 year old dog should. His limping and stiffness had completely gone. Rita returned to see her vet, who was amazed at the transformation, especially in such a short time. He told her there was no more need for the medication. Rita was ecstatic, as you may imagine. After the initial healing process, Louie needed an occasional dose of the homeopathic remedy for about four months. Rita has it on hand in case Louie needs it again, but he has not needed it for over a year. Today, Louis is a happy, healthy dog, with a strong immune system. Dogs have a tendency to suffer with heart conditions. This can go undetected for a long time, and when it is finally diagnosed, it can be too late for any effective veterinary treatment. Palliative care becomes the order of the day. However, this point comes too early for most dogs. It can be postponed. Everyone was meant to live long, healthy lives, your dog included. As a caring dog person, should you delay the change you now have at your disposal? It’s much easier to make healthy changes when there is no heavy emotional desperation about the condition of your dog. That is often when people search for solutions, but is a more difficult time, being fraught with concern. I know because I’ve been there and done that. But an emotionally charged human is not the best nurse in times of ill health. However, most people go searching for help when their dog is suffering in some way. Whether your dog is currently in great health, or suffering from a serious health disorder, now is the best time to make some healthy changes. Now is the beginning of the rest of your dog’s life. These changes have been responsible for the recovery of many dogs from degenerative health conditions, mostly considered irreversible by their vet. You understand that health is complicated and that there are many reasons why anyone, your dog in this case, is not healthy. You realise that something is very amiss with the way the world currently views dog health, so are prepared to make the necessary changes. You don’t want to make any drastic changes to the diet or health care of your dog. I know my approach to canine health care works. Within a 30 day period, if you try everything I suggest and still don’t see improvements to your dog, then I will give you your money back in full. Why do I offer this guarantee? Because I really feel the pain you feel, the helplessness, the frustration with the current mainstream treatment of canine health. So I want to make sure you get the help both for you and your dogs sake, but without risk to you. What is your dog worth to you? How much this information will save you is hard to quantify, as I don't know your dog's state of health or your situation, but I can say that if you follow the suggestions, it can save thousands in vets bills and much heartache. Just click on the button below to proceed to our secure server and order with your bank card online. as it’s in PDF form. PS I am also being selfish. Seriously, I want this to work for you. If I’m lucky, then I’ll get a testimonial from you, a before-and-after snapshot. This will help spread the word. Then more dogs will have healthier lives and more people will spend less to keep them healthy. It's good for you, your dogs, the environment and me. *To convert to your currency http://www.xe.com/currencyconverter/.